Baseball history comes to life on video for Cleveland Indians and Boston Braves fans in the 1948 World Series, a 1953 interview with Bob Feller and Jim Hegan of the Cleveland Indians and a special segment on former Braves hurler Johnny Sain explaining the use of his invention, the baseball "Spinner"! 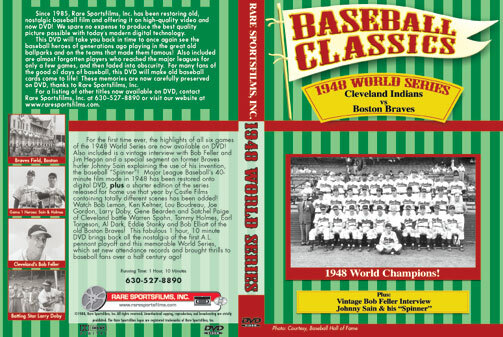 Now available on VHS for handy reference or nostalgic viewing, this 1 hour and 10 minute collection of rare film footage covers all the highlights of the 1948 World Series won by Cleveland, as well as the first ever A.L. post-season pennant playoff at Fenway Park vs. the Red Sox. The official World Series film by Major League Baseball has a running time of about 40 minutes, however you'll also enjoy the shorter edition of the series released for home use that year by Castle Films, and even though it runs about 8 minutes and covers only games 1, 2 and 6 at Braves Field, it contains totally different scenes than the Major League Baseball version. Next you'll enjoy a Marty Glickman interview with the Indians great battery, Bob Feller and Jim Hegan for the TV show "TV Baseball's Hall Of Fame". In this segment, you'll see rare scenes of Feller as a youngster on his father's farm and pitching in sandlot games. During the interview Feller and Hegan discuss the '48 World Series and the controversial pickoff play, how to pitch the great American League hitters Hank Greenberg, Joe DiMaggio and Ted Williams, how to hold the ball for different pitches, Fellers' victory in the 1946 All-Star Game at Fenway Park and highlights of that game in which Ted Williams hit two home runs, the second off Rip Sewell's famous "Blooper Pitch". New shots of this feat show Williams watching a strike go by, then picking the ball right out of the air and blasting it over the bullpen fence! For Boston Braves fans, there's a 1972 interview with former Braves mound mainstay Johnny Sain showing the use of this "Spinner" to show how a ball is spun by a pitcher to make different pitches. Then, interesting scenes from Johnny's own home movies show him in his tomahawk Braves uniform using his unique adjustable cement block backstop to work out prior to spring training!